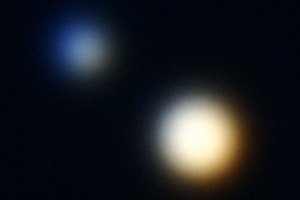 Double star Albireo, at the head of Cygnus the Swan. Whenever this happens, I think back to a night in my youth when the same sort of thing happened to me. I was in my early teens, living under the relatively “dark” skies of Alamo, in the shadow of Las Trampas Regional Park. I walked outside and looked up to the sky to see a dazzling light, one that I swore I’d never seen before. Its sheer brightness was enough to make me do a double take, but the way it flickered and flashed in every color or the rainbow– red, blue, green, maybe a glint of yellow– made me wonder if I were seeing a supernova, and if I should run inside and report it to someone. As it turned out, it was the star Sirius, in the constellation Canis Major, to the left of Orion– and though it’s a member of a winter constellation, you can still see it, low in the southwestern sky after dusk. Sirius is the brightest star in our sky–after the Sun of course– with enough intensity in its light for the color-sensing “cone” cells in our eyes’ retinas to register. The prismatic flashing of different colors you can see in Sirius is caused by its light being refracted in Earth’s atmosphere and the various colors being split apart, like light passing through a prism. Though there are some other stars bright enough to show their true colors to our human eyes– such as “red giant” stars like Antares, Betelgeuse, and Arcturas– most stars are only detected by our more sensitive “rod” cells, which paint pictures in our brains in shades of gray. The fact of the matter is that the night sky is full of color– it’s just too subtle for our eyes to perceive. Telescopes, even small ones, can bring out the colors in objects in space, collecting enough light to stimulate our color vision or to allow a camera to capture a color image. The subtle colors of the night sky begin to reveal themselves, from the blue-whites and yellows and oranges of stars to the pinks of clouds of hydrogen gas (nebulas) to the soft blue-greens in distant planets like Uranus and Neptune. You can check out our colorful universe as seen though Chabot Space & Science Center’s large telescopes at http://www.chabotspace.org/vsc/observatory/astrophotos.asp, or come up on a public viewing night on Friday or Saturday to look through the telescopes with your own eyes. Benjamin Burress is a staff astronomer at The Chabot Space & Science Center in Oakland, CA.